BYD E6. 2011 to date (prod. n/a). 5-door wagon. F/F, 48 kWh electric. Expensive electric car, with launch delayed to 2011 from original 2009 promises. Pilot taxi programme in Shenzhen. 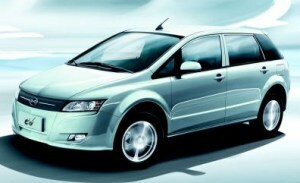 BYD claimed 300 km from a single charge; Bitauto testing managed 200 km with 20 per cent capacity to spare. Very spacious and quiet, and felt like a petrol-engined car behind the wheel.